So it has been a few weeks since my last review of Tokyo Ghoul √A, but this episode has prompted me to write this post, which contains massive spoilers. You’ve been warned. – Not even a minute in, Yoshitoki’s face goes from 😀 then :|. Choppy. – Akira and Naki’s fight scene. WHAT THE HECK WAS AMON DOING?! Amon could have prevented Akira from being bitten by Naki. Why didn’t we get to see Naki biting into her leg anyway?! If you’re going to rate this anime MA, might as well go all out, no? – how Akira’s quinque is animated. I don’t know. The scene where she and Amon jumps down one floor is strange. Does her quinque subdue the impact of hitting/landing on the ground because it twirled around her as she’s landing? – Kaneki and Sachi’s fight scene. Unbearable. Choppy. Kaneki’s mask somehow unzips itself due to a punch in the stomach. WUT. I literally scoffed. The action-reaction makes no sense. It’s nothing like the animation we saw in the fight scene between Kaneki and Yamori. What’s missing in my opinion is more of Kaneki’s monologue. I understand that the lack of it is to keep his motives mysterious and make him look like a BAMF. 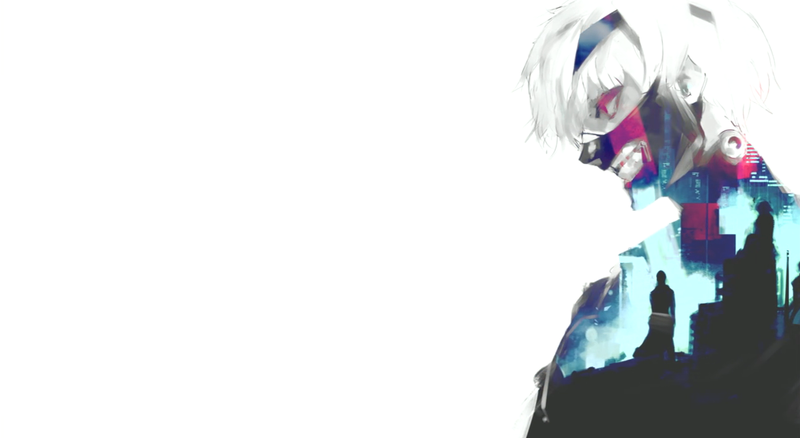 However, I think what makes Tokyo Ghoul so special is the psychological effects that cause Kaneki’s metamorphosis. In the manga, he transforms into “kanekipede” because he ate ghouls, lost his sanity, and had real motives (i.e. to protect those he loves by becoming stronger). I feel his transformation in the anime lacked a catalyst. He was staring at a pile of, what could be ghoul, bones one moment and the next, he’s writhing on the floor with his newfound power…….. wut. My biggest beef is with Kaneki and Sachi’s fight scene. Kaneki explicitly states “I’m here to free you, Sachi-san,” and Sachi attacks him because he has Rize’s scent. OH-KAYYY. Add to the fact that Eto intervened at the end, which means she was probably watching the whole scene unfold. I believe there could have been a better way to propel the plot forward. I thought we could see Kaneki battle with Amon, and Amon questioning his change of morals and everything. Basically if Kaneki is a video game character, I want the anime to grind him until he’s powerful. The first season did a poor job showing his character development, and I fear this season may be unfolding the same way despite Sui Ishida’s efforts. Did I mention censorship? Akira slashes two ghoul prisoners’ heads and blood gushes out, but instead of seeing red, we see inverted colors. I also have a feeling the censored the flashback by blackening majority of the screen, but I hope that’s not the case. I think the best thing about the episode is the artwork depicted in this week’s ending song, as shown above. The animation coupled with the artwork is more beautiful and fluid than the animation in the episode. Exaggeration but it’s somewhat true. I’ve been a bit disappointed with second season so far o.O I mean first episode was so good but now I feel like it’s a bit stuck and seriously Kaneki…wish he stopped being so mysterious!! I totally agree; the first episode was amazing. I noticed so far Kaneki’s screen time has been reduced to 2-5 minutes per episode (sans episode four). I understand that there are other characters that need to be introduced, but I feel like I understand their development more so than Kaneki, haha. Have you watched the latest episode?